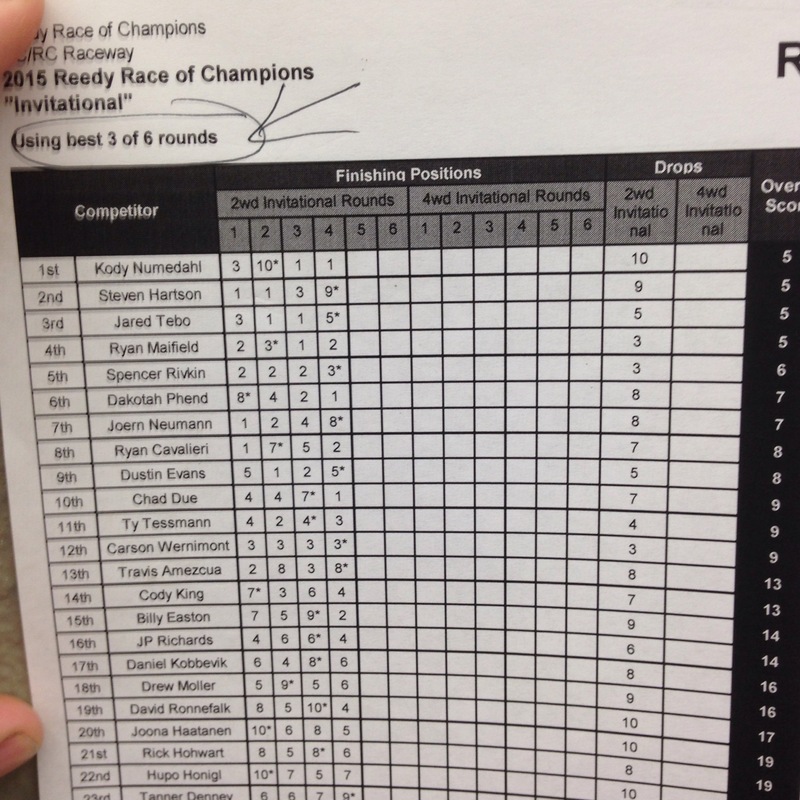 It is time again for the Reedy Race of Champions. This race is very unique, 30 invited drivers, and we race heads up twelve times, six races with 2wd buggy, and six races with 4wd buggy. The race is in California, at the awesome track, OCRC. I flew in Wednesday afternoon, and that evening was check in for us Invitational drivers. It’s a spec tire event, so we were able to get our tires and mount them all up. Thursday, we were getting on the track for some practice. We only get three, 5 minute practice sessions with each car, so I need to have a game plan for my setups and make sure everything is ready to roll. My cars are ready, and I’m ready to get out on the track. Practice went pretty good. 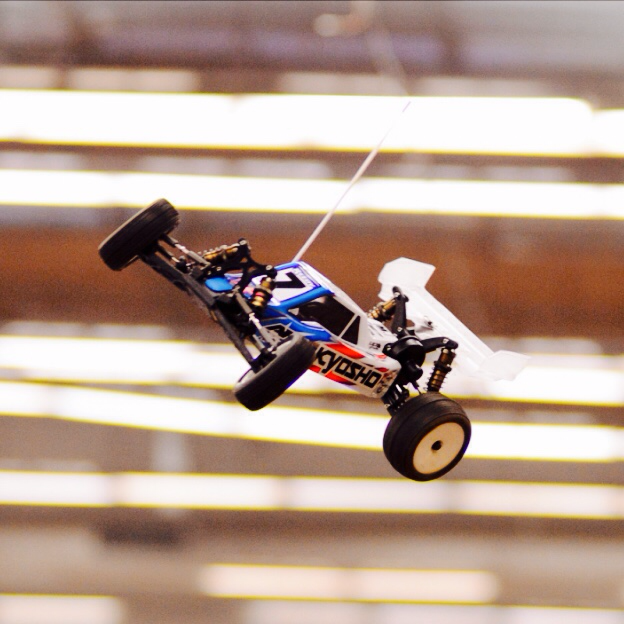 Joe Pillars is racing in the Open 2wd Buggy class, so we’ve been testing some setup things with him. Both my cars felt pretty good in practice. I was making some small changes, and I was going in the right direction. In P2 of 2wd buggy, I made an unfortunate mistake and broke my car pretty early, so that was a bummer. The day went pretty fast, and before I knew it, all our practice was done. After practice, we drew numbers for our starting positions. They sort the races random, using numbers 1-30, then we draw numbers. I drew 26, so where there is a 26, they put my name. That is just about the most random and fair way they can do it. Friday is here, and now it’s time to race. Today we race 4 times with 2wd buggy. 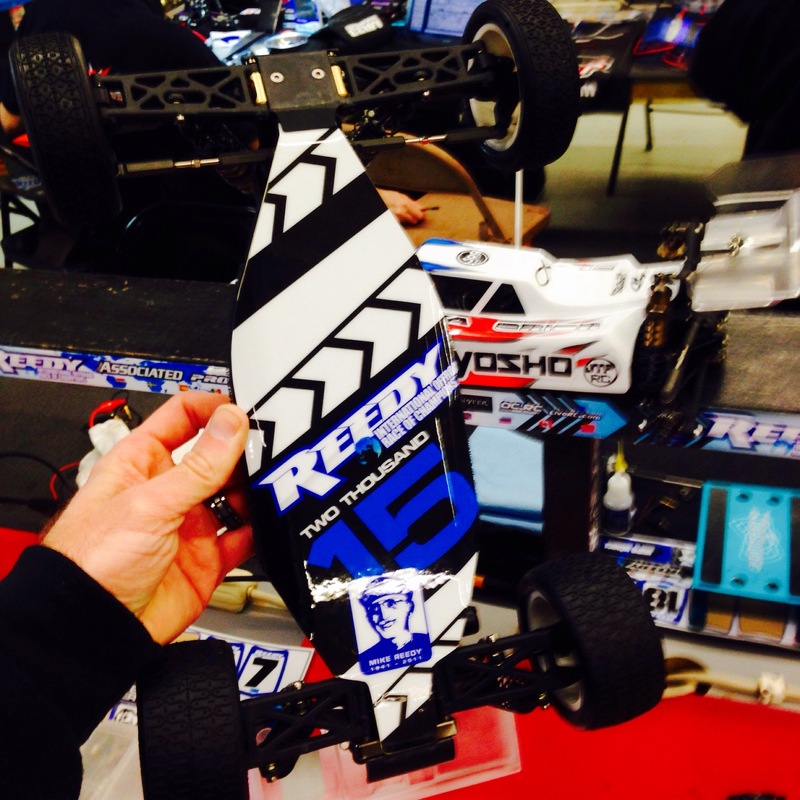 When we rolled into the track, they had these sweet looking Reedy Race chassis skins. My first race was up, and I was starting mid pack in 5th. My car felt good, but I was a little nervous and didn’t drive as well as I wanted to. You never really know how the races are going to go, and how the track will race, especially starting mid pack. I ended up 3rd in R1. R2 I was starting inside row 1 in the 1st position. I made a small change to my car, and I was ready. 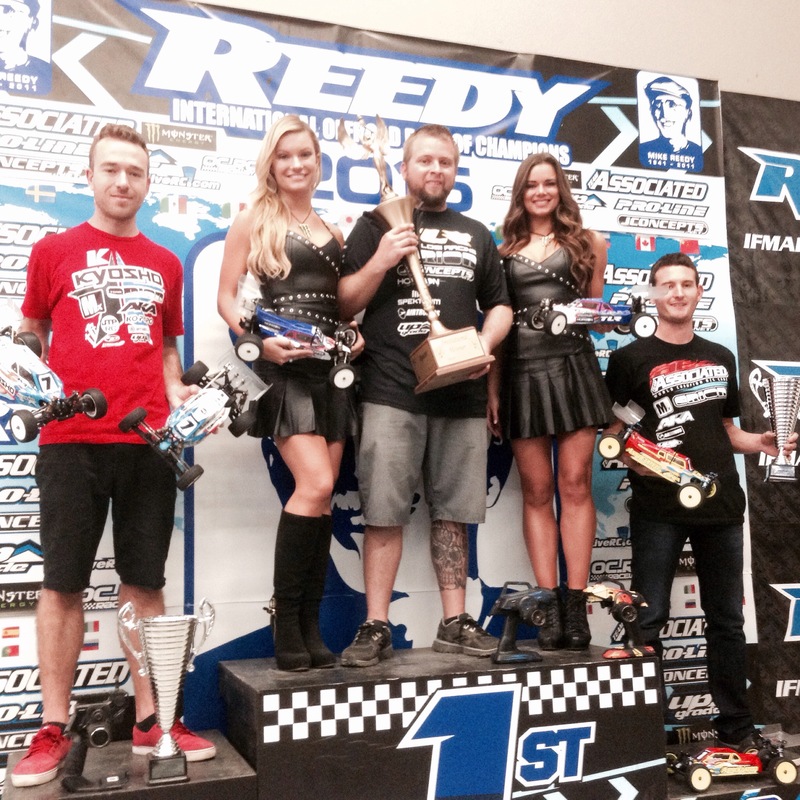 My car felt awesome and I had a great race to take my first win of the 2015 Reedy Race. R3 I was starting 4th. This was a pretty wild race, but my car felt awesome. Towards the end, it got crazy. I was in 2nd, the leader crashed in front of me, then 3rd place dove to inside to try to pass me. We all kind of came together, and I ended up in 2nd, behind Brian Kinwald. The building erupted in crazy cheers as Brian lead, but I wanted by, and made a pass. Phend was right behind me and he tried a do or die move coming onto the straight on the last lap, but I held the lead to take another win. R4 I started 6th, but would have a harder time in this heat to get to the front, and would end up 5th. After Day 1 I was sitting pretty good. 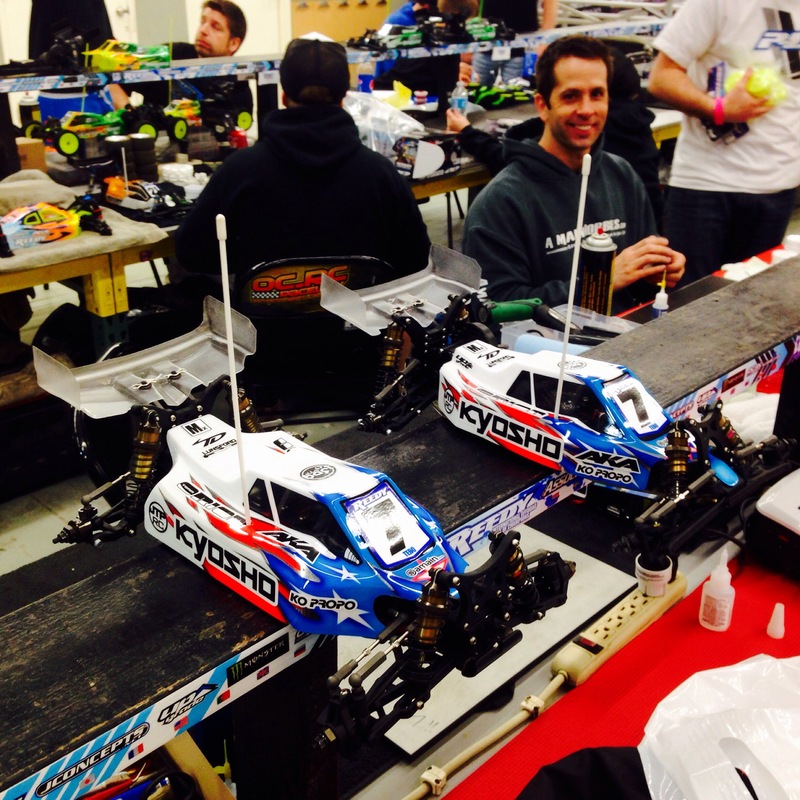 Saturday, we raced 2wd two times, then had a short 3 minute 4wd practice, followed by two 4wd races. R5 I started on the back row in 10th. I had a plan to go into turn one on the outside and run it in deep. My plan worked as there was a crash on the inside, and on the first lap I went from 10th to 5th. My car was feeling amazing, and I was catching the top four. I made a good pass at the end of the straight, but the driver I was passing, turned down on me, causing his car to crash. I wasn’t going to stop, be he was complaining on the drivers stand, so I gave up two positions to get back behind him. That’s the toughest part about this race, you race people that are different speeds and people that your not comfortable driving with. This race got a little wild at the end, and I made some passes right at the end to finish 3rd. R6 was a key race for me. I start 3rd, and I have Cavalieri in front of me, and Maifield starting behind me. I needed to beat both of them. I got a good start and both me and Cav passed the car that started 1st, and we were battling for the lead. Cav went just a touch wide after the switch back, and I punched the throttle on the inside. I made the pass and tried to pull away. Cav stayed close, and then I made a mistake over the triple, landing on the pipe and crashing. Cavalieri must have followed my line as he did the same thing, we both got marshaled and continued our fight. I was mistake free after that and took an important win. After 2wd I took scores of 1st, 1st, 1st, 3rd, 3rd. I was tied in points for the lead, but I had the most 1st place finishes, so I was leading. Now it was time for 4wd. In the practice, me and Maifield went out together and it seemed we were pushing our cars pretty hard. My car was ok, but I wasn’t comfortable with the rear end. I made some changes for R1 and I was ready. R1 I started 7th. My car was better, but still not exactly where I wanted it to be. I drove a decent race, having a few mistakes and I finished 4th. I made another small setup change to R2. This race I started on the front row in 1st. I had a clean, tone to tone win. It felt good to drive good and take another win. It was also great to end Saturday with a win. I was in the hunt to win, and there were only 4 races left on Sunday. R3 I started 7th, but had a great race. I was really patient and just worked my way though the pack and into the lead. I pulled a decent lead, but then with a little over a minute to go, I made a mistake in a turn and gave up the lead. Drew Moller passed me, but I charged hard behind him, and pushed him into a mistake on the final lap, and I took the win. R4 I would start 2nd. I was patient and got into the lead on the second or third lap. Steven Hartson followed close behind me the entire race, but I held the lead and took another win. It was really coming down to the end for the overall win. Me and Maifield were really close in points, and Cavalieri was just a couple points back. R5 would be a key race. I race Maifield, and we have only raced each other 1 other time this whole event. He started 4th, and I start 8th. I got a great start and was pretty close behind him in 5th on the second or third lap. Unfortunately a car crashed in front of him, and Ryan passed that car, but I couldn’t, and it got between us. It took me a few laps to pass, and then Maifield was gone. I finished 3rd, with Ryan in 2nd. In R6, I needed to win and have Maifield finish 3rd or worse. We were not in each others race, so I couldn’t take any points from him. I started 5th, with Cavalieri right next to me. We both had a good start and were 2nd and 3rd in just a couple laps. I needed to push to catch the leader, but I wasn’t able to. I made a little mistake, and gave up 2nd to Cav, and I finished 3rd. That point gave Maifield the overall win. I ended 4wd taking a 1st, 1st, 1st, 3rd, 3rd, the same points I took in 2wd. 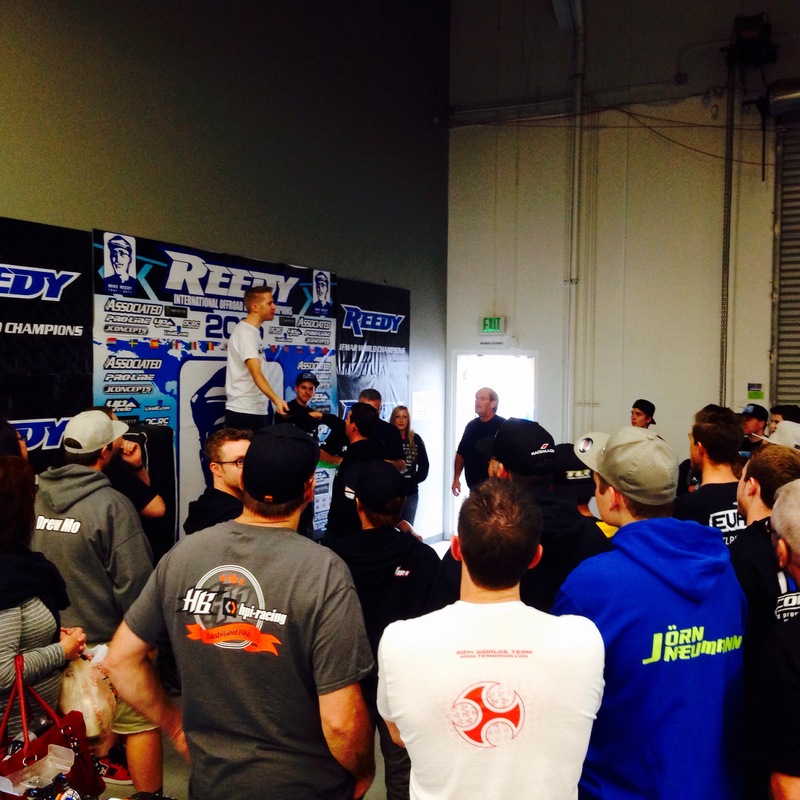 All in all, the 2015 Reedy Race was a success. I came in with a good attitude, and drove well. Most importantly, both my cars drove amazing. I’m really happy with my setups and my driving, so the work is paying off. Of course I want the win, but this race is crazy, and there are tons of other variables. 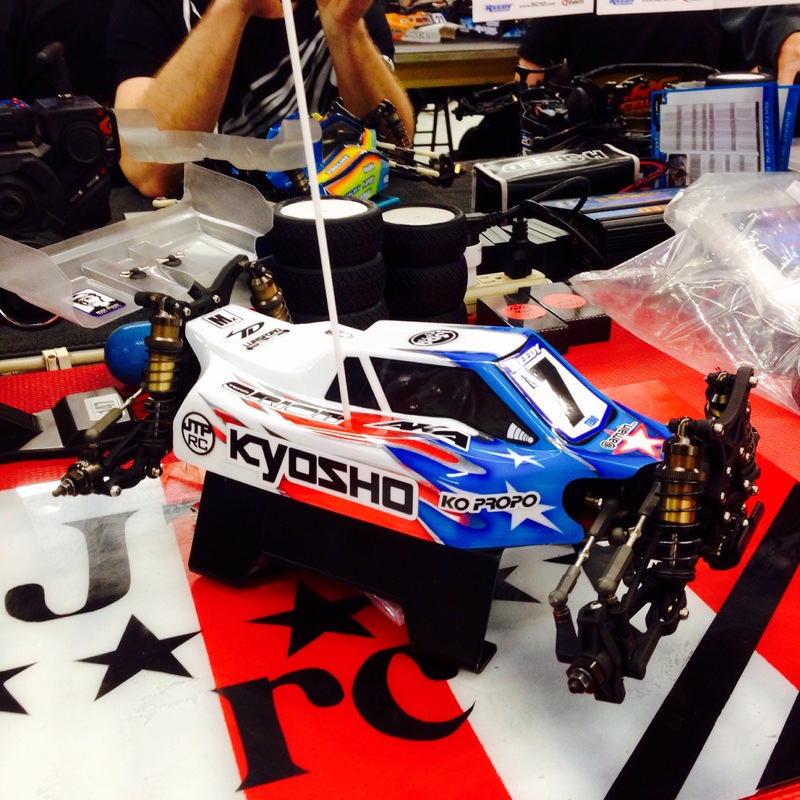 Thanks to my great family for cheering me on all weekend, all my amazing fans, and my sponsors Kyosho, Orion, AKA, Mx, Ko Propo, JTP RC, Amain.com, Upgrade RC, TD Paint, Lunsford, MIP, LiveRC.com, Bike Source, Specialized, Rock Brook Church, and my Lord and Savior Jesus Christ! Thanks for reading, hope to see you at the next race, God Bless! Congrats Jared. I was told your 2w looked the best out if everyone. That’s a big step from just a few months ago I’m sure. Thanks. Yeah I was really happy with both my cars to be honest. My 2wd has been amazing lately. I’m very excited for 2015! Well done, great result! Are you going to get much AstroTurf practice in ahead of the worlds? Can you set your cars up for the turf? Drive like you did at OCRC and you should have no problems adjusting to the astro turf. Great start for 2015. Caught some of the replays on Live rc. Clean driving out on the track. Best of luck for the rest of the year. God Bless! !